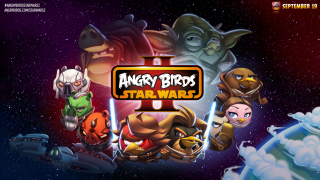 'Angry Birds Star Wars II' will launch on September 19. Both Padawans and Jedi Masters alike should prepare their thumbs for "Angry Birds Star Wars II," set to release across mobile platforms, game consoles and computers on September 19. A long time ago in a galaxy far, far away (well, actually, November 8, 2012 in Espoo, Finland) Rovio released "Angry Birds Star Wars." Combining two of the best-loved franchises in recent memory had a predictable effect: The game sold like gangbusters, and had fans clamoring for a sequel almost immediately. As the first game retold the events of the original Star Wars trilogy (Episodes IV through VI, 1977 to 1983), it's only fitting that "Angry Birds Star Wars II" will cover the prequel trilogy (Episodes I through III, 1999 to 2005). Instead of Luke Skywalker, Han Solo and Chewbacca, players will take control of feathered versions of Anakin Skywalker, Obi-Wan Kenobi and Padmé Amidala, as well as 27 other characters. Players will also be able to play as the series' malevolent green pigs by joining the "Pork Side" of the Force. "At this point, we will not comment on rumors or speculation that Jar Jar Binks will be in the game," read a statement from Rovio. In case you spent the last few years avoiding every electronic device more complex than a toaster, you're probably familiar with "Angry Birds." The casual gaming juggernaut puts the player in control of a roster of colorful avians, each with a different special skill. By launching them out of a slingshot, the player can demolish shoddily constructed fortresses that house evil, egg-snatching pigs. The second game will introduce one more novel feature: Telepods — real world toys of the Star Wars angry bird casts that rest on electronic plastic bases. Placing a character on top of a mobile device will allow "Angry Birds Star Wars II" to scan the toy and bring a digital version of the character into the game. This technology has already seen great success — both in terms of gameplay and profit — in kids' games like Activision's "Skylanders" and Disney's "Disney Infinity." The Telepods, which will range from $5.99 individually to $39.99 for packs, will launch alongside the game in September. "Angry Birds" and "Star Wars" have almost unparalleled cachet in pop culture, so it doesn't take a Jedi Knight to predict that the game will probably be big. If the Telepods catch on, "Angry Birds" could eventually become a real competitor in the market for full-priced kids' games. You can make your own "Evil Empire" jokes about Activision and Disney here. This story was provided by TechNewsDaily, a sister site to SPACE.com. Follow Marshall Honorof @marshallhonorof. Follow us @TechNewsDaily, on Facebook or on Google+.